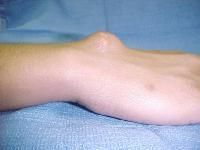 A ganglion cyst is a small sac of fluid that forms over a joint or tendon (tissue that connects muscle to bone). Inside the cyst is a thick, sticky, clear, colorless, jellylike material. Depending on the size, cysts may feel firm or spongy. One large cyst or many smaller ones may develop. Multiple small cysts can give the appearance of more than one cyst, but a common stalk within the deeper tissue usually connects them. This type of cyst is not harmful and accounts for about half of all soft tissue tumors of the hand. Ganglion cysts, also known as Bible cysts, are more common in women, and 70% occur in people between the ages of 20-40. Rarely, ganglion cysts can occur in children younger than 10 years. The cause of ganglion cysts is not known. One theory suggests that trauma causes the tissue of the joint to break down, forming small cysts that then join into a larger, more obvious mass. The most likely theory involves a flaw in the joint capsule or tendon sheath that allows the joint tissue to bulge out. It is usually soft, anywhere from 1-3 cm in diameter, and doesn't move. 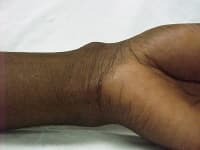 Most ganglion cysts cause some degree of pain, usually following acute or repetitive trauma, but up to 35% are without symptoms except for appearance. If pain is present, it is usually chronic and made worse by joint motion. When the cyst is connected to a tendon, you may feel a sense of weakness in the affected finger. Whether you have symptoms or not, your ganglion cyst can benefit from medical evaluation. Your doctor can be sure that you have a ganglion cyst, keep you from worrying, and help decide on the best treatment plan for you. A ganglion cyst does not need to have emergency treatment unless you have significant trauma. A routine check by either your doctor or a specialist in bones and joints (an orthopedist) is often enough. A physical exam is often all that is needed to diagnose a ganglion cyst. 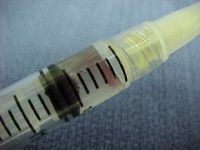 Your doctor may get further confirmation by using a syringe to draw out some of the fluid in the cyst (needle aspiration) or by using ultrasound. An ultrasound picture is made as sound waves bounce off of different tissues. It can determine whether the bump is fluid-filled (cystic) or if it is solid. 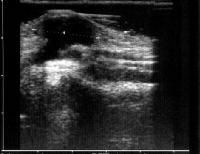 Ultrasound can also detect whether there is an artery or blood vessel causing the lump. Your doctor may send you to a hand surgeon if the bump is large or solid or involves a blood vessel (artery). Magnetic resonance imaging (MRI) is used to see the wrist and is very useful for ganglions. One drawback to this diagnostic method is the cost of the procedure. In the past, home care has included topical plaster, heat, and various poultices. It even extended to use of a heavy book to physically smash the cyst. (Sometimes this is called "Bible therapy.") These forms of treatment are no longer suggested, however, because they have not been shown to keep the ganglion cysts from returning and could, in fact, cause further injury. Many cysts can disappear without any treatment at all. Various treatments have been proposed over the years. Some include no specific treatment other than reducing worry regarding the cyst, using a needle to remove the cyst's contents (aspiration), or surgery. Aspiration usually includes placing a needle into the cyst, drawing the liquid material out, injecting a steroid compound (anti-inflammatory), and then splinting the wrist to keep it from moving. If you have the fluid drawn out of ganglia on the wrist 3 separate times, your possibility of being cured is between 30% and 50%. The rate of success is higher with ganglion cysts on the hand's flexor tendon sheath. Surgical removal of the cyst is needed when the mass is painful, interferes with function (especially when your dominant hand is involved), or causes numbness or tingling of the hand or fingers. Most likely after surgery, your joint will be splinted for up to 7 to 10 days. A splint is a hard wrap that will keep you from moving your joint. Recent studies show that splinting for a long period of time doesn't really help, and use of the joint soon after treatment is being encouraged. Your doctor may ask you to return for a check-up after your surgery and will decide if physical or occupational therapy is needed. Follow-up care will be based on your personal needs. Because the cause of a ganglion cyst is not known, it is difficult to tell how to prevent them. Early evaluation and treatment are recommended. Author: Elisa Aumont, MD, consulting staff, Department of Emergency Medicine, University of Mississippi Medical Center. Coauthor(s): Verena Valley, MD, director of ultrasound, associate professor, Department of Emergency Medicine, University of Mississippi School of Medicine. Editors: Scott H Plantz, MD, FAAEM, assistant professor, Department of Emergency Medicine, Mount Sinai School of Medicine; Francisco Talavera, PharmD, PhD, Senior Pharmacy Editor, eMedicine; Ron Fuerst, MD, clinical assistant professor, Department of Pediatrics, University of South Carolina College of Medicine, and director, Children's Emergency Center, Children's Hospital of Richland Memorial Hospital. Gude, W. Curr Rev Musculoskelet Med, December 2008.